It’s an enviable problem to have - being so busy that you start having to juggle multiple requests for the same date from couples. While many wedding photographers will notice that a single date seems exceptionally popular, you may also find yourself having to turn away inquiries as your calendar fills up. Here are my tips, and a few templates, for how to let couples down gently. The easiest way to tackle any problem is to have a clear idea of how you’re going to deal with it before you come upon it. 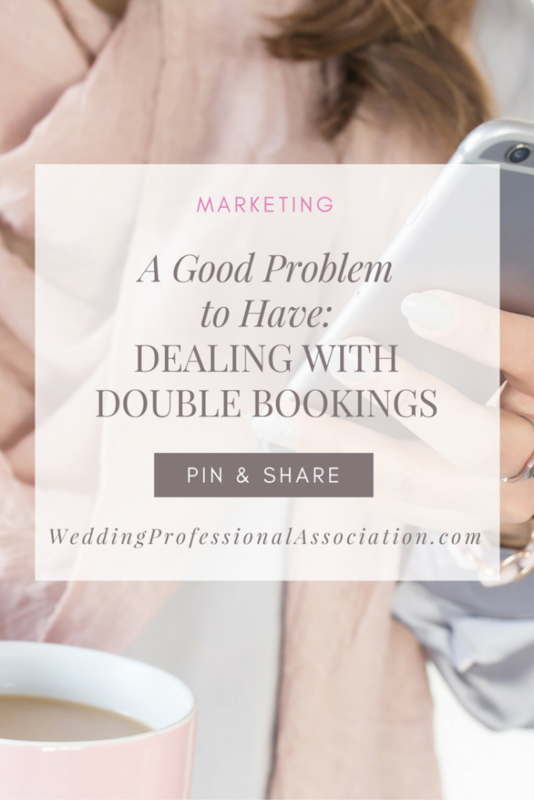 Your first step in dealing with double bookings is to create a policy (either an internal policy that you never share with anyone, or an external policy which you post on your website, appointment scheduler or send via email) about how you will handle multiple inquiries for the same date. This should be fairly straightforward - first come, first served. But what if couple A contacts you on Monday, but can’t meet until Friday, and couple B contacts you on Tuesday and can meet right away? Decide if first come, first served applies to when they first contact you, when they meet with you, or when they sign an agreement and pay their deposit. No matter when you set your starting line, it’s important to always let your potential couples know what is going on. Tell them you have had more than one enquiry for their date, and share with them how you handle this sort of interest. You’ll also need to create a followup workflow - if you’ve decided that you don’t consider a date booked until they sign their agreement, set a specific time frame in which a couple has to return their signed contract and deposit. If you have a couple (or couples!) waiting to hear back from you, make that a very short timeframe - no more than 24-48 hours. A good list of wedding professionals you can refer couples to will be your saving grace here. Being helpful to a potential client even when you have to turn them away will leave you looking like the hero, and will have them singing your praises even though they didn’t get to book you. Next, acknowledge their request with gratitude. A little thanks can go a long way. Let them know their date is a great choice, obviously, because you’ve got another couple/couples looking at the same one. Then, outline for them your policy of how you handle multiple enquiries, and what the next step in your booking process usually is. Now, offer them an alternative to going through your booking process and potentially not getting to book you. 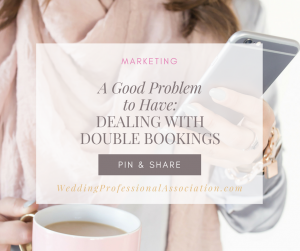 This may seem counterintuitive to actually landing the booking, but it shows you’re eager to help them find a wedding pro no matter what. Congratulations on your engagement! I absolutely love that you’ve chosen the Old Historic Ultra Hip Venue for your wedding day, it’s one of my favourite venues! I’d like to thank you so much for reaching out to me about being your wedding professional. I love being able to be a part of making wedding days unforgettable. You’ve chosen a great day to get married, and it’s turned out to be very popular. I’ve received a few enquiries about July 20th, and I always make sure to at least talk to every couple about how I can help them. To keep things fair, I allow the couple who contacted me first to have first dibs on the date, but I only hold dates for paid, signed contracts. I’d love to set up a time to meet you both and go over the details of your wedding with you! If you’d like, I can also refer you to another wedding professional, so we can make sure your day goes off without a hitch! Thank you so much for meeting with me the other day. I loved hearing about your plans! Unfortunately, the date you were enquiring for has now been booked. Some days I wish I had a way to clone myself so I could work for all the amazing couples I meet! I’d be happy to refer you to another wedding professional, and wish you all the best on your wedding day and beyond. You’ve chosen a great day to get married, and it’s turned out to be very popular.Unfortunately, I’m already booked for July 20th. If you’d like, I would be happy to refer you to another wedding professional, so we can make sure your day goes off without a hitch. All the best for your wedding and life together! We would love to hear from you about how you handle turning clients away! Have a tip you want to share that we didn't cover? Leave a comment! Stephanie Ostermann is the sort of person who you meet for coffee and end up telling your whole life story to. As a writer, speaker and communications strategist with a head over heels love for words, Stephanie has an innate understanding of the way a well placed word can ignite a potential client’s desire to work with you and only you. She lives in Calgary, Alberta, with two amazing kids, a black lab, and an endless supply of lipgloss, Sharpies, and books she'll get around to reading - some day.